We have seen and read hundreds of articles about credit debt, and you will always see that people have to tackle the problem from the root cause. If you are paying back your debts, and you don’t know how you got there in the first place, then the chances are very good that you will be back in debt real soon in your near future. In this article will I explain the most common reasons why people end up with debt on their credit cards. When we compare different types of debt, then we will see that credit card debt is one of the biggest problems in South Africa, and one of the most difficult debts to get out of. 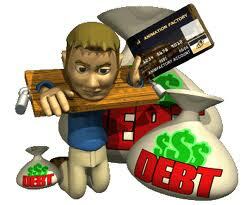 Credit card debts are created with desire, the need of something that you cannot afford at the time. When you add these debts together and add interest rates, then you will see that your debt can be much higher than you thought it was. The first cause would be the economic climate of today. People do not even have enough money to pay for their everyday spending anymore. People find themselves in a position where they do not have choice but to go in debt. That is why I would suggest everybody must save money from a young age. We never know when we will need extra cash. Debt is avoidable, but we will have to show some discipline. Emergencies are also one of the main causes of credit card debt. We never know when the unexpected will happen. We have seen numerous cases where people get involved in a motor accident or serious illness, causing them to pay for the damages with their credit cards, as they do not have those immediate funds at the moment. Therefore is it again to have an emergency savings fund, so that you can avoid going into debt. One of the biggest reasons and causes of credit card debt is that people want to live the same life as their peers. People tend to live beyond their needs. So do not try to get everything that your neighbours or family members have. Jealousy can create a lot of credit card debts for you. The last factor is without a doubt, the creditors in South Africa. They are giving credit to people that simply can’t afford to into debt. Luckily the National Credit Act of South Africa is there to help us with that issue. It is always good to know that there are ways of getting rid of that debt. You will need to show a lot of discipline in order to get rid of your debt, but more important, to stay out of it for good.